OKLAHOMA CITY - Oklahoma City Dodgers right-handed starting pitcher Wilmer Font has been named to the 2017 All-Pacific Coast League Team, the league announced today. Font has emerged as one of the PCL's top pitchers this season and paces all of Triple-A with a career-high 170 strikeouts. He is scheduled to start tonight's 7:05 p.m. game against the New Orleans Baby Cakes at Chickasaw Bricktown Ballpark. Font (9-8) set Oklahoma City's all-time single-season strikeout record since the team rejoined the PCL in 1998, surpassing Matt Perisho's 150 strikeouts during the 1999 season. He has also recorded five games with at least 10 strikeouts, tying Oklahoma City's single-season record set in 2016 by José De León. The starting pitcher from La Guaira, Venezuela leads the PCL with a 3.58 ERA, 1.13 WHIP and .226 opponent average. He ranks tied for third with 24 starts, tied for fourth with nine wins and sixth with 128.1 innings pitched. He leads all PCL starting pitchers with 11.92 strikeouts per nine innings. Font, 27, racked up a team-record 15 strikeouts May 15 against Sacramento at Chickasaw Bricktown Ballpark, marking the most strikeouts in a single game by an Oklahoma City pitcher since the team rejoined the PCL in 1998. He surpassed the previous Oklahoma City team record of 14 strikeouts set by Chuck Smith June 23, 1999 in Game 2 of a doubleheader at Memphis. He also put together the highest single-game strikeout total by a PCL pitcher since Sacramento's Dallas Braden recorded 17 strikeouts Aug. 27, 2007 against Colorado Springs. Font was also named a midseason PCL All-Star and started the Triple-A All-Star Game July 12, retiring the side in the first inning on four pitches. He was named PCL Pitcher of the Week twice this season, taking home the award for the periods of May 15-21 and July 10-16. He is in his ninth professional season and second in the PCL after signing with the Dodgers as a free agent Dec. 21, 2016. Former OKC Dodgers infielder Willie Calhoun, now in the Texas Rangers organization with Round Rock after a July 31 trade for pitcher Yu Darvish, was named All-PCL Team second baseman. Calhoun represented the Dodgers on the midseason PCL All-Star Team and still ranks among Oklahoma City team leaders in hits (111, 2nd), doubles (24, 2nd), triples (5, 2nd), home runs (23, 2nd), RBI (67, 2nd) and games (99, 5th). To view the complete, 12-man All-PCL Team, visit pclbaseball.com. This marks the third straight year a member of the OKC Dodgers was named to the end-of-season All-PCL Team, following infielder Rob Segedin in 2016 and catcher Austin Barnes in 2015. 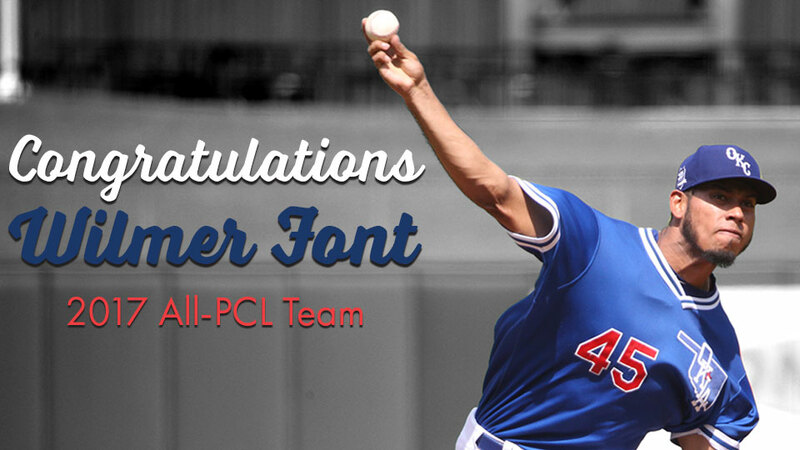 Font is the 11th Oklahoma City team member to make an end-of-season or postseason PCL All-Star Team since OKC rejoined the league in 1998.